Park and Ride airport parking services offer courtesy shuttle buses between the airport and the off-airport car park. 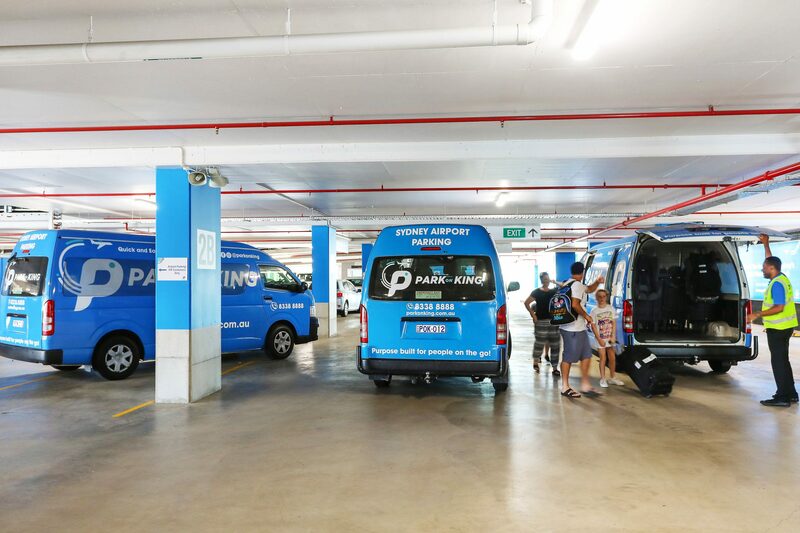 While this is often the cheapest alternative to Sydney Airport parking, most shuttle services run on a schedule with some being on a 30 minute timetable, so there can be astonishingly lengthy waiting times. We completely understand this dilemma as you’ve just returned from a long flight and you just want to get home! The answer to this, is our on-demand shuttle service. Simply call us when you arrive at the airport and we’ll send one of our shuttles to personally pick you up! Our on-demand shuttle bus service is free with every booking. If you’re looking for the cheapest airport parking, you’ll most likely choose an off-airport car park. Although most off-airport car parks are located in the Mascot vicinity, their pick-up points vary significantly. Some off-airport car parks will direct you to the public Express Pick-Up point which is in fact a 15 minute walk from the terminal, with you needing to drag along your own luggage and any tired kids! The better alternative is to look for airport parking services that pick you up from the dedicated shuttle bay, located less than 2 minutes from the terminal. Now you might be questioning why don’t we all use the same pick-up point? Airport parking providers such as Park on King actually have to pay to enter the dedicated shuttle bay so you can bet we take your convenience very seriously. Wouldn’t it be nice if we could assume that all airport car parks were the same? The ugly truth about the airport parking industry is that some are just empty gravel yards masquerading as a car park, and even worst, shade cloth car parks claiming to offer undercover parking. Before you book your airport parking, look for real photos and real reviews from real customers. Thousands of travellers flying out of Sydney Airport choose Park on King every day for our purpose-built airport car park. We’re proud to have over 1,000+ five star reviews from our happy customers! It’s easy to fall for the relaxed nature of an airport Meet and Greet service where you are seamlessly picked up in your own car but these cars are often carelessly driven to a muddy field several kilometres away. Holidaymakers can sometimes get speeding fines while they’re away or even return to find new dents and scratches on their vehicles! Some airport car parks will still request you leave your keys behind even if you choose a self-park option. This is so cars can be moved around like a game of Tetris when the car park is full. A tip would be to separate your house keys from your car keys so you’re only leaving your car keys behind but there’s nothing to stop them from racing your vehicle out of the car park either, clocking up additional kilometres! Make sure to read the fine print and ask yourself, would you trust your car keys to a stranger? When you park with Park on King, you’ll find your car exactly where you left it because you get to keep your keys. It is always worth pre-booking a parking space in advance in case you’re travelling during peak periods and the car park is booked out. This is especially the case during school holidays and long weekends. Park on King offers the option to pre-book your parking up to 9 months in advance with discounted early bird rates so you can make significant savings just by being organised! Traditional long-term airport car parks are known targets for theft as they often have little or no security. Beyond closed circuit security monitoring, look for an airport car park that is staffed by real people 24 hours a day, seven days a week. When you park at Park on King, you can travel with total peace of mind knowing that we are a gated car park with over 40+ CCTV cameras and 24 hour roaming security. As a frequent traveler I can't wait until this opens. We need better priced parking options like this for Sydney Airport! The service was fantastic, the car was in the same shape we left it and everything was in its proper place. Pickup was quick and the driver was friendly and provided excellent service. The staff on location were very friendly and helpful with the children. I'd definitely recommend Park on King if you need to park at the airport! A parking experience unlike any other! Amazing competitive pricing along with efficient , friendly and caring service conpletely sets them apart from other parking services we’ve used in the past. Recommend Booking in advance and allowing enough time to get to the airport as even though their service is on time and minutes away from the airport, traffic getting in to the terminals can be unpredictable! Couldn’t recommend them highly enough and look forward to parking here again. Thanks Park on King! Best car park place ever! Good service, close to the airport and good prices. A great location and alternative to airport parking with much better rates. The staff were also very friendly and helpful! Fantastic place to work.Owner is a 5 * boss.Public users of this service are very likeable.Driving the shuttle service is very enjoyable. Friendly staff, prompt transfers, very reasonably priced. Will definitely park here in the future. Excellent! Drop off and pick up was easy, fast and smooth. Happy and friendly staff. Will definately use again. Thank you! Great service and conveniently located. Domestic terminal is very walkable as there are shortcuts built into car park (ask the staff there for directions). Easy to find, close to the airport, number plate recognition for entry & friendly staff waiting to direct you where to park. Easy process from start to finish. Highly recommend Park on King ?. I'll definately be back! Absolutely fantastic facility and service. We parked our car for one week and utilised the shuttle bus to and from the airport. Nothing was too much trouble for the lovely staff, who even had a booster pack to start our car which had a flat battery on our return. We will be back if we are lucky enough to travel again. About time someone brought some competition to the Airport Parking Mafia, and Park On King delivers in spades! Brand new facility, state of the art entry and exit systems, friendly and helpful staff and all for half the price of any of the competition! Facility was clean, shuttle busses were brand new and both drivers professional and helpful. Will not hesitate to use them again! Will definitely be spreading the word on where to park now for our trips away! Park on King is located so close to the airport. Easy to enter and exit. All staff were friendly and accomodating. Catered well for my 4 young children - had appropriate car seating for all ages and swift drop off and pick up to and from the airport. Would definitely use Park on King again. Thank you! Used Park on King for the first time and had an infant travelling with us. They called first thing in the morning to check if we needed a child seat on way to the airport and back for the shuttle service. Very attentive checking in and out. They knew exactly when we needed to be collected as well. Very seamless parking service for the cost as well. Definitely better than any other park and fly service around Sydney. What a fantastic service. We were greeted by friendly staff at 5.30 am. the transfer to the international airport was smooth and efficient the return trip to the car park was just as good. I will use this service again and I would recommend it to everyone. the staff know how to provide excellent customer service. Thank you for taking the stress out of parking at the airport. Highly recommend. Affordable, secure & close to the airport. Excellent customer service, friendly and accommodating staff. The shuttle service to & from the airport was swift and reliable, also catering for needed kids seats. Great experience, will definitely use again. Excellent service from start to finish!! Service was exemplary! Eva at reception desk was extremely helpful and both drivers John and Roland were efficient, friendly and helped us with our luggage. We did not have to stand around and wait either. We will definitely be parking there again. Could not fault my experience with Park on King. The staff were friendly and eager to assist. It was really easy to book in and leave my car, the mini vans runs as soon as you need it and drops you right to the departures. After arriving at 6.15am I called them to come pick us up, due to traffic reasons they were a bit delayed, however kept us informed the entire time, which we really appreciated. Joe and Trish made a great pick up team. Would highly recommend this service! Just used Park on King for the first time and I have to say that I was very happy. It's amazing to now have a more affordable parking option near the airport and as I travel a lot for work, it's going to make all the difference for me. The staff were very helpful and the shuttle bus drivers were beyond friendly. I didn't have to wait long for a shuttle at either end. So much better than getting on the Blue Emu bus! Thank you - I'll be back! We booked our car in for 11 days as we found the rates more than acceptable (compared to other airport car parks). The car park is extremely secure. Drop off and pick up at the airport were done quickly, courteously and efficiently. We did have a "hiccup" with extending our stay for one day, but after speaking to a manager and explaining what happened, the issue was rectified (thank you Steven). In all, an excellent service which we will be using again. First time I used park on king and it was amazing experience. Nice to see affordable parking option near the airport. John the shuttle bus driver was friendly and extremely helpful, carrying the bags and also keeping the kids entertained. Would diffidently use the service again for Work and the next holiday. I've parked here twice and I've had such a great experience both times. The service from all the staff is impeccable and the cost is value for money. All the staff are lovely! They offer a complimentary shuttle service to and from the airport, so you don't need to think about the commute in between. Highly recommend!! I just used Park on King for the first time and the whole experience was great! Online booking was very easy, when we arrived it was easy to find a parking spot. We were warmly greeted at reception and didn't have to wait at all for a shuttle to the airport. The driver was very friendly. Our journey back was equally as good. We only had to wait a few minutes for the shuttle back to our car. We were very happy with the service and will definitely use again! Park on King....."Parking"....What a catchy name for a business. My wife and I have used your services 4 times now. I got to say, the service is fantastic, your staff are so friendly and actually like to have a chat and how the owner, yes, the owner was driving customers to the terminal. The parking facilities are top notch, always get a "good park" so to speak. Very clean and professional. I wish Park on King all the best, keep up the fantastic work and all the best in the parking future. Cheers! Such a 5 star experience at Park on King. From the moment we arrived until the moment we left, the staff were very professional and friendly. Loved that the bus was ready to go as soon as we got to reception and dropped us straight to the departure doors and a simple phone call on arrival to find a bus was already on the way and no waiting time when we got to the pick up spot which was only a very short walk outside. We chose the outdoor parking option which was great. I will be telling everyone to be using this service and will be back here again for sure. Very happy with the reasonable price! Thank you for offering such an amazing service. Highly recommended! Great in everything, from the friendly staff, speedy service, nice facilities, on time shuttle, affordable price and convenient location! Keep up the good work and shout out to Eva, Roland and the entire team! Til next time! Am so impressed by their friendly and efficient service. Booking a parking spot was so easy and their rates so reasonable. When I left my camera bag in the shuttle bus, Annabel in the office was able to ring the driver Wayne and ask him to wait at the Qantas Terminal so I could get it from him. On our return, the pick up process was quick and we didn't have to wait very long at the pick up point for the shuttle bus. Thanks you to all the staff at Park On King! Will definitely use them again. I was so happy with my experience with Park on King! They were so friendly, polite and efficient. As I drove in there was a staff member that greeted you on arrival and told you where to go. When I arrived at reception with my bag there were drivers lined up waiting to take you, and the drive was literally about five minutes from the car park to the Domestic terminal. I will definitely book with Park on King again. This is the best parking option at the Airport - new, clean efficient and also across the road from the hotels so easy to sleep in a little later, go park and get to your flight on time, no traffic hassles. Plenty of incentives, besides the fact that the pricing is very competitive. Have tried a few of the ones around the place, some that have come and gone - I see this one being there for the long run. Full marks! Awesome customer service and pleasant experience. It was easy to book, easy to find, boom barriers open automatically when it recognizes the vehicle number plate, clear signage for where to park and spacious parking lot. Was always skeptical of parking at or around the airport for a few days, but the Park on King experience was so good and easy. Over and above all this, the staff are very courteous and friendly. Our shuttle bus driver was David, a pleasant and friendly person. Helped us with our luggage too. No waiting time for airport drop. For the pickup, shuttle arrived within 10 minutes after I called. Keep it up guys! Very happy with our experience with this company. They were very time efficient and easy to communicate with. We paid extra for a deluxe car wash and the car looked and smelled great when we collected. They also had car seats available for our 7 month old. Would use again! Thanks to our drivers Michael and Ethan. Thank you so much for your amazing service, Joe and Simon. These guys were the absolute BEST and made the trip to and from the airport so very pleasant. Would recommend them a million times over and would not hesitate to use them again! I have been parking here for over 8months almost on weekly basis and find each and every staff member extremely helpful and delightful to deal with. They are fast, efficient and well priced. I highly highly recommend them. We have just booked a second time trip. First experience was example of outstanding customer service. Very friendly, funny and helpful staff. Getting to and from the terminals a breeze. It was a month or so back but a special shout-out to Danielle (hope I remembered the name correctly). Great family owned company with competitive prices. Very friendly staff at the front desk - effortless check in/out system. Driver was helpful with loading/unloading our luggage. Highly recommended - will definitely book again. I’ve just booked again and used the service twice before. The staff are always friendly and helpful and it’s a great way to travel, having your car there, and knowing it’s secure. Getting to and from the airport is very efficient and the time allowances they advise are accurate so we’ve been dropped off and picked up in good time. Great service! Great service....friendly staff, convenient location and very well priced. Quick and easy to and from the airport. Even for the VIP parking, it is very cheap. Will definitely be using this regularly for both work and leisure trips. Park on King is the best way to park and fly. Located very close to the domestic airport the shuttle has always dropped me off very quickly and pick up has been around 10 minutes max. All staff are very helpful and friendly and the drivers great. Finally it is probably the cheapest parking option near the airport so you cant go wrong. Fantastic customer service. Love parking my car with this company. They are always helpful. They are very affordable and will continue to use there service for all my trips short or long. We recently left our car at Park on King for nine days over the Christmas period. We found the service from the Reception office both for the drop off and pick up to be friendly, efficient, and professional. Our driver, Michael could not have been more helpful. We had the pleasure of him dropping us off as well as picking us up. The service we received from him would certainly be rated as 5 star. All of this for very reasonable parking rates. We'll be back. We used this over the Christmas period and it was perfect. I'd previously used a nearby service but their undercover option proved more costly. This was the right decision as the hail storm hit while we were away so the multi storey parking here was unaffected. I found everyone very friendly from the reception to the transfer drivers. Drop offs and pick ups were all quick even considering our travel hours (needed to be parked at 5am on a weekday and left at 10pm on a Sunday). Parked for four nights during my trip to Cairns mid December. This business really deserves the five star ratings it has received from its customers. The staff is not just efficient, but friendly too. My return flight was delayed (which meant I was going to go beyond the time that I had booked and paid for) but the team took care of it without batting an eye-lid. Don't be afraid to park here. It is genuinely a great business and that's why it has this many five star ratings. Great service and the best value.. They made it so easy that I won't be using any other car park. Highly recommended. I have used Park on King a number of times now. The staff are attentive, professional and friendly. The car park is spacious, good sized parking bays. Well done Park on King on a great well priced product. Excellent service, convenient location, clean and modern facilities. Fantastic value for money as daily rates are very competitive. Deservedly 5 star-rating. I will use Park on King again next time I travel! Have parked here 2 times..staff are so helpful.Starting from the initial booking,to arrival,to departure. Shuttle drivers were friendly.Buses were clean .we will be using these guys at least 3 times a year and would highly recommend. Well done to all the staff. A huge thank you for making our trips start and end with ease .. great job guys. Absolutely outstanding customer service. You know they get it right when you are greeted by name as you enter the car park and then kindly instructed where to park. The easiest airport parking experience to date. From entering the car park to arriving at the airport all in 12 minutes. Eva is amazing. I was running late for my flight and called ahead to let her know. She calmed me down then delivered me safely and quickly to the airport. I made my flight and had a great weekend thanks to Eva and the friendly service of Park on King. I used to park at any random parking station near the airport until I started using Park on King. Their facilities are modern and clean and easy to navigate and the team are always helpful, accommodating and friendly. The on-call shuttle service is particularly good, just make sure you leave enough time for the regular airport traffic in the early morning and evenings. I don't need to shop around for airport parking anymore, because I'm confident Park on King is the best value and a great experience every time. Highly recommend this parking facility. What great service! Friendly, helpful and obliging staff. Plane was running late at night but they were all too happy to wait considering it was after hours..picked us up after 11pm with a great attitude..WOW! Clean facilities and convenient location. Will definitely be using again. I've changed my idea about parking at the airport completely. I always used to uber in and out. This was an unbelievably easy, value for money option. The staff were helpful and friendly the entire time. Shout out to Adam who drove me back after my flight. So impressed with this place. Parking super well priced, everything ran seamlessly, from booking to entering the car park with electronic number plate readers, to getting the shuttle to and from the airport. Takes less time to get the shuttle and be back at the car than most wait times for a cab or Uber. We saved at least $100, and time and stress, parking the car here for a day. I hope they keep the prices low! Thanks so much. Still definitely be using this again. Can get any simpler and cheaper, I gave park on king a try after friend recommended me. It was unbelievably cheap and convenient. Shuttle takes you over to the terminal in next to no time. Personally I thought it takes me the same time to park at Sydney terminal and get to the gate. But at park on king I paid fraction of the price. The place is top class staff and shuttle drivers are super friendly. I guess I won't be parking at Sydney terminal ever again. By far best off site airport parking and service available. I highly recommend Park on King.. A lovely clean modern facility with great friendly & prompt service. Very efficient and professional. And friendly! Park on King provide a fantastic service at a great price! Will definitely be using them again! Great pricing, very friendly drivers and efficient. Such a great service and friendly, helpful staff. Fabulous staff, really welcoming and helpful. Quick airport transfer service. Highly recommended. Got a ride yesterday with Eva to the airport. Excellent service. I don’t know why I haven’t found out about this before. Wonderful service! Glad to be pick up by Michael a very friendly and very patient with us. Great service and lovely staff, thank you Eva and Steve P! Awesome experience 👍🏽. Very friendly staff. The customer service is outstanding. Highly recommend Park on king. I will definitely be using them in the future. Great staff and great service. Quick and efficient. Would highly recommend to anyone. 1st time user & service was excellent. We will be back. Simon was great for both trips. The team are really friendly and the service is great. Prices are also really competitive! Absolutely, best price, car wash is excellent and service is brilliant. I wont be going anywhere else. Excellent service. Fast and friendly. Close to Sydney airport. Very welcoming staff, super easy and stress free. Highly recommend! Very efficient! Everything was straight forward and quick especially when I was running late. Secure facility and fantastic customer service. Highly recommend especially if travelling with children. Great customer service and deal, highly recommended. Five stars for the service from Eva this morning. This is why I am a repeat customer. Fantastic, efficient and professional service, thank you Eva, we’ll definitely use this place again! great customer service and always with a smile...great team of drivers and office staff are wonderful and friendly ..
Great airport parking service! I would like to thank the wonderful reception staff and the drivers Steve P. and Brett. Great service from super helpful and friendly Eva. Thanks for your lovely help this morning. We really appreciate it. Only parked there once, but excellent service. Would highly recommend. Fantastic and friendly service. Could not more highly recommend! Great service,drop off and pick up very quick,friendly helpful staff highly recommend. great service, easy to access, reasonably priced. the only airport parking I use now! Great staff, great price and great location with exceptional shuttle services. Quick and easy way to make a booking. Pick up/drop off service was quick & simple. Great location -great staff and service! Convenient, well priced and super friendly and helpful team made this service an absolute pleasure to use. Every time without fault these guys provide excellent service! Smooth pick up and drop off! Thanks Roland!!! Eva was fabulous and very helpful! Eva was so kind and polite as we left our car this morning and driver Steve was just as nice. Definitely recommend. Amazing service. Was shuttled within 5mins of arriving in both directions. Makes travelling so simple - easy, reliable friendly service. And at a great rate.